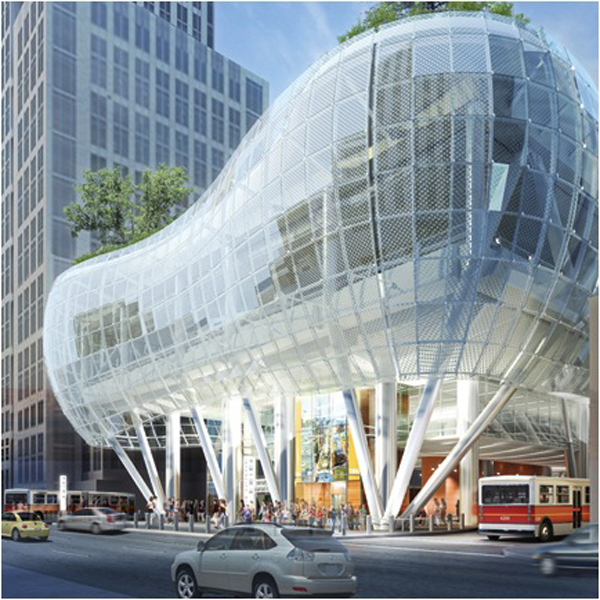 This particular edifice is the proposed new San Francisco Trans-Bay Transit Center at First and Fremont Streets. James Howard Kunstler is a rather interesting American author/intellectual/blogger of the intelligent center-left variety. I've read a fair bit of his stuff over the years, mostly about peak oil. Anyway, one of his pet peeves in life is ugly postmodernist architecture - a subject that I share the same taste for! He posts one of these every month. I've looked back through the last couple of years and he sure does find some awesome and supremely ugly buildings. Michael and Greendruid should recognize this one. I think the best way to describe this is "kitsch architecture". "A man should not outlive his teeth"
I've been there! Not inside, but past it anyway. Indeed, I do. Arguably, that place is the trashiest place in Canada. Though, one must admit that the best view of the falls is on the Canadian side of the border. Yes, kitsch it certainly is! Though, that particular piece seems almost avant-kitsch since it is so far beyond mere kitsch! You poor soul. I visited the US side of Niagara Falls as a child (my mother was from upstate NY) but not the Canadian side. Hopefully it hasn't been mass produced. I haven't seen Niagara Falls in a long time. I don't miss the town at all - it is a massive tourist trap. The natural beauty of the cascading river is a breath-takng sight to see though. The natural beauty of the cascading river is a breath-takng sight to see though. Do you mean 'the waterfall is very nice to look at'? I haven't seen Niagara Falls in a long time. I don't miss the town at all - it is a massive tourist trap. I has (or at least had) a really nice youth hostel, though. I got to Niagara at the end of a very long, solitary road trip between college and my first job. That was definitely the nicest placed I stayed along the way, not counting the one night I broke down and paid for an actual hotel room.